We've reduced over 350 items in our latest Offers of the Month selection, with huge savings on fantastic gift ideas for the whole family. From pyjamas and slippers to jewellery and fragrances, you'll find 100's of ways to give wonderful Christmas gifts year without breaking the bank. 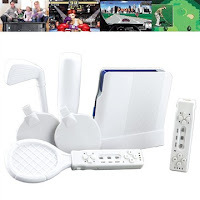 Take a look at this Interactive TV Game, its a 48-in-1 interactive TV Game set which comprises console, 2 wireless controllers and sport accessories. Features: arcade and olympic games, golf, tennis, boxing and bowling.